SKODA has claimed an impressive fourth consecutive annual award for its Superb model. The car was named Best Upper Medium car at the annual Fleet News awards. 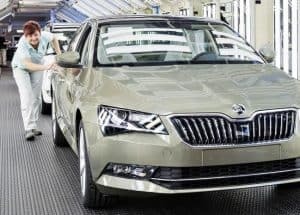 The SKODA Superb picked up its unprecedented fourth title in as many years due to what the manufacturer claims are a number of standout features of the model. With an impressive boot capacity of 660 litres – extending to 1,950 litres when the rear seats are folded down – the Superb is a practical solution for an array of applications for fleet operators. At the same time, the model offers outstanding comfort, sustainability, affordability and the latest technologies, ensuring it is cheap to run but exciting. Meanwhile, features of the Superb that have helped the model stand out from the crowd include an Amundsen sat nav system with eight-inch touchscreen display, automatic blind spot detection, leather upholstery and heated front seats as standard. Mr Williams added that an “unbeatable combination of luxury and practicality” is one of the main reasons the Superb remains such a popular model with both judges and buyers.